…Judge among yourselves. Is it proper for a woman to pray to God with her head uncovered? Does not even nature itself teach you that if a man has long hair, it is a dishonor to him? But if a woman has long hair, it is a glory to her; for her hair is given to her for a covering. But if anyone seems to be contentious, we have no such custom, nor do the churches of God. Let’s be honest. Most of us would say that it’s crazy to even consider preaching about something like hair length. Who would touch that in a Sunday School class, let alone a sermon? Now, this is understandable. I don’t want to preach this sermon either! We rightly want to avoid works righteousness and making people self-conscious or inadequate. We want to avoid getting into ticky-tacky specifics. Let’s stick to the important stuff. But, at the same time, I don’t see how we can work through this section of 1 Corinthians without observing that, whatever else he’s doing, the Apostle Paul is giving a pastoral statement about the Corinthian Christian’s style and dress. He tells the men not to have long hair, and he even gives an argument as to why long hair on women is a good thing. What’s he doing, and what can we learn from this today? Last week, we took a look at what the specific “headcoverings” were in 1 Cor. 11 and why Paul told the women in Corinth to wear them while praying and prophesying. Today, I’d like for us to take another look at that passage in order to see the basic principles that Paul uses to give advice about style in general. Once we move past the question of “headcoverings,” we still see important and challenging points. The Apostle Paul believes that there are better and worse ways to dress and adorn yourself, and he believes that we can figure this out. He believes that there is a concept of appropriate decorum, and he thinks that Christians should be able to recognize this and apply it. Sometimes you can fall into religious or theological errors by going too far in one way or the other. But other times wrong answers are not just caused by extremes. Sometimes they are caused by missing categories altogether. In our case today, we find it nearly impossible to talk about decorum, or how things should look, because we have lost the old concept that was called propriety. “Propriety” is not a simple list of dos and don’ts but rather a kind of sentiment that can tell is something is “fitting” or “appropriate.” It’s always a little subjective, but it is not entirely subjective. It is a concept that belongs to wisdom rather than to strict law, but it is still a concept that it is meant to have authority in our decision-making process. Paul appeals to this concept of propriety in verse 13. He says, “Judge among yourselves. Is it proper for a woman to pray to God with her head uncovered?” Notice what Paul is doing there. He is most-certainly not saying that everyone is free to come to their own conclusions no matter what. No, he has made it clear that he wants them to comply with his instructions. But what he is doing is appealing to the Corinthians’ own understanding and ability to decipher what is and what is not “proper.” They can tell, Paul says, and they should respect and submit to this more-or-less obvious judgment. Indeed, “proper decorum” is Paul’s main authority in this section. It is what he thinks will make sense and carry persuasive power. This is why he does not simply issue a command or appeal to an earlier passage of Scripture. He reasons from the nature of God, what sorts of things bring glory, and the concept of headship. “A man indeed ought not to cover his head, since he is the image and glory of God” (vs. 7). Why shouldn’t man cover his head? Because he should do something to show his unique “image and glory of God.” But then, why should a woman cover her head? Because she is different. She is “the glory of man.” Therefore, it is proper for her to look like it. How Should We “Find” Propriety? …if it is shameful… Is it proper? … Does not even nature itself teach you? As we have said, Paul certainly does want his audience to listen to and obey his words in this section. He is not simply giving an opinion. But, at the same time, he doesn’t give a straight command, and he doesn’t appeal to divine law. He’s trying to explain certain customs that support proper decorum, and he wants the Corinthians to see how it all makes sense. The fact that a lot of it doesn’t make much sense to us today is why this passage is so challenging and uncomfortable. That means that we need to be sure to ask the right questions. What does Paul do to make all this make sense? What sort of appeal does he make in order to support the customs that he is promoting? What Paul does is very interesting. He appeals to the order of hierarchy in the universe, beginning with God and working its way through Christ, man, and woman. Then Paul appeals to the creation story in Genesis. And within this creation story, he also appeals to the purpose of man and woman, what they were created for. “For man is not from woman, but woman from man. And man is not for the woman, but woman is for the man.” This is the authority that supports his argument. What this tells us is that “propriety,” as a concept, means being consistent and harmonious with God’s original creation order, with His design. That which is proper is that which is in line with how God intended things to be and that which “works best” for that arrangement. Anything that contradicts that arrangement is improper, anything that grossly contradicts or harms that arrangement is actually shameful. We find out God’s design by reading Genesis 1 and 2, by reading later Biblical comments on Genesis 1 and 2, and then by thinking carefully about the details of it and the “big picture” of the Bible. An important point that is being assumed throughout this section is that our personal style is a symbolic expression of who we are. This is actually a belief that our modern world does share. We mostly all do agree that we express who we are by how we dress and what kind of hair style we have. But in our day this is totally individualistic. Paul wants us to “express ourselves” in a different way, by looking like creation, like Adam and Eve. When Paul says that woman is “from man” and is “for man” (vs. 8-9), there are a few things going on. We’ll have to explain that in more detail next week, but for now I want you to see that Paul is pointing out our origins, where we come from, and our purpose, what we are for. He believes that both of these tell us how we should “express ourselves.” This means that we should adopt a fashion that symbolically expresses this truth. We need to “look like” who we are, and “who we are” should be determined by God’s original creation in the Garden. We should also create communal customs that will shape our values and expectations, giving others something to imitate. 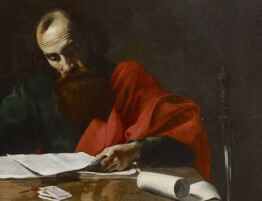 For the Apostle Paul, proper decorum is a necessary tool for preserving order, which is in turn necessary for securing love for and inclusion of the whole church. This means that propriety is something that is public, something that affects us as a group. And it can shape community behaviors and morals in very important ways. “What barbarism will be incurred, if we do not preserve dignity in the Church, by conducting ourselves honorably and becomingly?” Does that strike you as a quaint or perhaps even “uptight” question? Do you think it’s a little too much? Well, I would just ask you to take an honest look at our situation today. Most of the churches in our country have stopped conducting themselves with dignity. They have either sold-out to the values of the world, namely a sort of liberal-progressivism, or they have attempted to cater to entertainment desires, leading to the “cool” and “hip” pastor who, let’s admit it, is usually not-so cool and hip but rather a little goofy. Even many of the conservative churches have lost what could reasonably be called a dignified worship style. Instead, most of them seem like a concert or a pep rally. “Propriety” really is a lost art. And has this had damaging effects on the larger society? Again, take a look. Are we seeing a rise in barbarism? I would suggest that we are. Violence and cruelty hold a visible place in our society. Additionally, we have what can only be a crisis in the loss of stable family structures and civilizing customs. Children grow up without fathers, and they are tossed into disruptive and even abusive situations at a very early age. This then creates a cycle in which they take up destructive habits for themselves and begin participating in all of the same kinds of activities. Now, the point of making these depressing observations is not to say that “kids these days” are worse than they have been in the past. I also don’t think that the main culprits to blame are music, movies, or television shows, though these can be bad. The major problem that contributes to our cultural decline is the erosion of traditional customs and social constructs that should be teaching and reinforcing morals and propriety. We take away all of the ways that morals, manners, and responsibility are taught and protected, and so why should we then be surprised that people being to question morality, lose their manners, and refuse responsibility? And why do lose these customs? Part of the reason is simple fleshliness, or selfish sinful desire. But another part of it is that nearly all of us have lost the concept of “propriety.” Whether we are conservative or liberal, we have discarded this category. We demand either absolute law or total individual freedom. But without propriety, things quickly thin out, and we end up adopting a lowest common denominator approach to society. Churches, for their part, do not preach or teach about propriety because they are afraid of falling into legalism. But if the churches stop teaching it, as we have seen, everyone else soon follows after them, and before long it’s lost entirely. It’s a challenge to consider retrieving a culture of propriety. It’s a little complicated to explain, and it’s just plain intimidating to try to talk about. But we can start simply by noticing where “propriety” appears in the Bible and asking these big questions. Now, there is a lot more to say about this, and we can’t say it all today. Next week we will talk more specifically about masculinity and manhood in Christ, as well as femininity and womanhood in Christ. There are some important points of qualification that will have to be made about all of that too. So I ask your patience for those. This morning, however, I’d like for us to stick with our main point of propriety. Paul wants us to have an understanding of propriety and to use that sense of propriety when we present ourselves to other people. We should “look” like what we are, or rather, we should look like what we should be. None of this means that we are more or less acceptable to God because of what we look like. No, we are saved only because of the work of Christ on our behalf. “It is by grace you have been saved through faith, and that not of yourselves; it is the gift of God, not of works, lest any should boast” (Eph. 2:8-9). This sermon should not lead you to works righteousness of any kind. But, the fact remains that the Apostle Paul is not afraid to “go there” and instruct the Corinthians to critically engage the way they look. More than that, he wants them to “get it” and voluntarily embrace an appropriate decorum. To sum it up, what we see is that propriety applies to dress or “outward adornment.” Women should imitate the original creation of woman, imitate Eve as “helper suitable to Adam,” and they should do so in such a way that is glorious. Men, for their part, should imitate the original creation of man, and thus they should protect and provide, all the while glorifying God in all that they do, even in their sense of dress and public presentation. And we should all do this, in our appropriate roles, without having to have a strict list of dos and don’ts, without “law,” but because we recognize that this is “best” for us and because it helps others understand who they are and how to conduct themselves. Decorum is important. It sets a mood. But more than that, it actually teaches us who we are. As Christians, saved and liberated in Jesus, we should not be reactive to the decorum and fashion of the world but instead, we should take an active role, presenting ourselves in ways that tell the truth about who we are, who are in God’s eyes and in Christ Jesus. We should desire propriety. We should long to reflect God’s creation. And we should want to do so as a way to love others and promote the well-being of the Church of Jesus Christ.